Highly attenuated modified vaccinia virus Ankara (MVA) serves as a candidate vaccine to immunize against infectious diseases and cancer. MVA was randomly obtained by serial growth in cultures of chicken embryo fibroblasts (CEF), resulting in the loss of substantial genomic information including many genes regulating virus-host interactions. 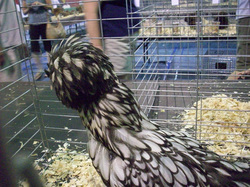 Scientists have been doing genetic experiments on chickens for a long time now. One experiment is too genetically alter broiler hens to make them grow faster and bigger than ever before. These experiments are inhumane and need to be stopped. The upside: Bigger fatter hens. The downside: These poor hens cannot even walk are in constant pain until the day they are brutally butchered for use as food for people.